Ossie Clark Long Sleeve Multi Coloured Stretch Shift Dress Size 14. Lovely dress perfect for many occassions. Lovley detailed neckline with long sleeves and zip back. Comes to knee. Looks fab on. Dispatched with Royal Mail 2nd Class. Please see my other items. Listing regularly. Topshop uk 16 Pink Liberty Print Frilled Tunic Dress 70,s Boho. Condition is Used. Dispatched with Royal Mail 2nd Class. Zara Womens 100 % Silk Paisley Print Tunic Dress Size S.
Zara Womens 100 %Silk Paisley Print Tunic Dress Size S, slight pull on back stitching in one small area SEE PHOTOS Otherwise in a good used condition worn only a couple of times. Superb ladies dress. Elastic band on waist. This beautiful retro style top is embroidered with various patterns on the hem, sleeves and body of the top. The pictures show it is 24 in from armpit to armpit, which makes it a size 24. I think I have shown the lovely design features in the photos. There is no stretch in this dress. It looks quite square across shoulders, but it is not. It is just because it is on a hanger as it is too small for mannequin. 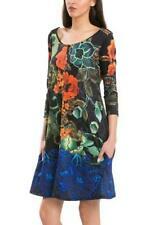 Monsoon ladies tunic style dress. Features black pleated see through three quarter length sleeves. Pleated design at the round neck. A lovely Laura Ashley Tunic/Smock style dress which is a purple in colour with an all over bold pattern, and a lovely trim to the hemline ~. THe dress is a size 14 it has been previously worn but it is still in great condition ~. Cute Monsoon Fusion silky black dress with gold dots and floral design. Concealed side zip, long sleeves with covered button at cuffs and fully lined. Deep scoop neckline with Peter Pan collar and little covered buttons at the bust (non-working). Beautiful dress in softest gunmetal grey velvet, with 70s styling including balloon sleeve and little puff to the shoulder. Sadly too small for me, never worn. No lining beneath.worn over a plain stretch bodycon dress or shorts and bralet. M & S Portfolio ladies dress. Bottom of dress and sleeves have plain black border. Asos white dress. Multiple ruffles and frills. Very 70's disco style. Stretchy style material dress with attached mock collar & bow 🎀. Stunning yellow dress with gorgeous mock collar adorned with faux pearl details 💛. THE LABEL STATES 'DRY CLEAN ONLY' BUT I HAD THE BLUE VERSION OF THIS DRESS AND GENTLY HANDWASHED IT WITH GREAT RESULTS. 50'S / 60'S BARDOT / OFF SHOULDER PENCIL COCKTAIL. WIDE / DEEP OFF-SHOULDER / BARDOT STYLE GATHERED NECKLINE. Used once for few hours, perfect condition Beautiful dress, very flattering and perfect for all occasions Offers welcome!! It has a button closure. It is size 18. Grab a bargain. BNWT Red Marks And Spencer Short Sleeve Dress. Ideal for Work/office, very smart and professional whilst looking very professional and smart. Size 12 Petite. Long gold Zip at back to fasten- pictured.